I struggled with the title of this blog post, so much so that it's taken me several weeks to sit down and write it. Normally, as someone who loves to write where words flow easily, I can sit down and crank out a blog post rather quickly but this one was different. 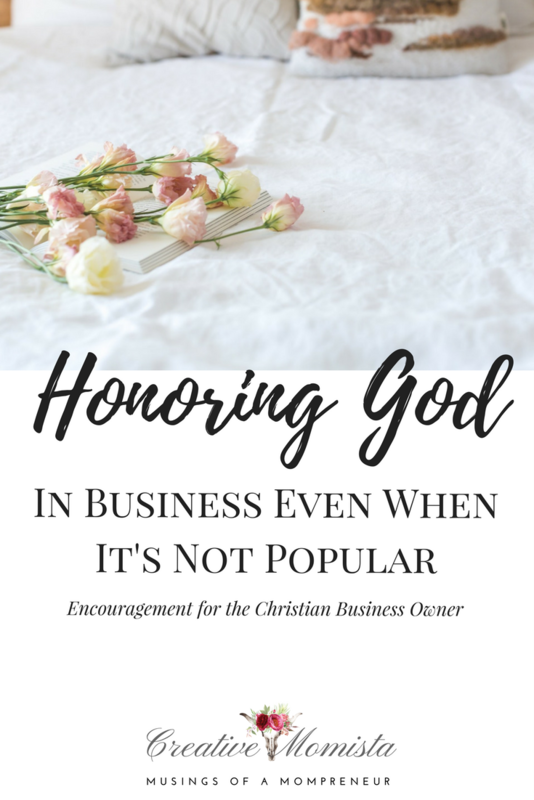 As I thought about how to title this blog post, I struggled because nothing else made sense but to say out loud "honoring God in business, even when it's not popular" is kind of hard to swallow. Why would honoring God not be popular? Well, after a few recent conversations with friends who are also Christian business owners and a very personal experience of my own (will get to that in a minute) the title of this blog post is, unfortunately, the cold hard truth for many Christian business owners who find it not so popular (or even worse, are facing backlash) for honoring their beliefs. Up until a few weeks ago, being a Christian business owner had not been a second thought for me personally. Yes, I have read stories where others have faced confrontation in staying true to their values and even legal consequences for standing behind those beliefs but I had never personally been faced with this as a Christian and business owner. In the latter part of October, I received a referral from one of my clients to speak with a wedding event planner who was in search of some social media and marketing assistance. We were introduced via email and as I scheduled a time to talk with them, I asked that they send me their website and social media accounts so I could look them over before we hopped on a call, a practice I follow for any potential client. After spending some time looking over their website and Facebook fan page, I determined that I was not the best fit for this client based on my personal Christian beliefs. A decision that was easy to make with my heart, but one that I wrestled with how to handle out loud. So, I prayed through it all weekend, consulted with my business partner, my husband and other women in my circle who I greatly value their opinions. In discussing this with my trusted inner circle, it was interesting to see how it caused anxiety for them too; what to say, how to say it, how to handle it, what not to say. I was advised several times not to be honest about why I couldn't work with this client and to be transparent, I too was tempted to come up with a "I am already so busy right now and can't help you but I wish you all the best in finding someone who has more time" lame excuse but here is where I struggled the most: I would never do that in any other situation with any other client. I was only considering that because of the sensitive nature of the subject in this particular situation. I even had one close colleague tell me "Don't dare say why because they will blast you all over social media for not working with them". If I wasn't already considering a cop out response, the thought of being the subject of a negative viral social media post definitely had me rethinking that honesty is always the best policy but I refrained from making an emotionally charged decision, especially one out of fear, and spent the weekend praying about it and taking my concerns and reservations to God for He is always my one and only Counselor. Hebrews 13:6 "So that we may boldly say, The Lord is my helper, and I will not fear what man shall do unto me." Corinthians 16:13 "Remain alert. Keep standing firm in your faith. Keep on being courageous and strong." As I sat down Monday morning to prepare an email response back to the business owner, I did not know how it would be received but I was at peace with accepting and dealing with whatever may come because I was staying true to my values while being honest and without judging or condemning. I appreciate your patience over the weekend while I was answering emails here and there being out of town for our friend's wedding. I didn't have a chance to look at or really dive into your website and Facebook page until last night so my apologies for not getting that done sooner. You seem to have a real passion for what you do and the world definitely needs people spreading love, light and and weddings are just so fun. All through high school and in my early 20's I wanted to be a wedding planner but just not what God had planned for my life. I know it can be a stressful business but a very rewarding one at the same time! After looking over your website and social media account, I want to be very respectful of your time as a business owner and very truthful and upfront with you. Because of my personal beliefs as a Christian, I am not going to be the best fit to tackle this project for you. You need someone who can passionately represent the voice of your brand and I would not be able to deliver that in way that your business truly deserves. As one business owner to another, thank you for your understanding and I greatly appreciate you reaching out to me and I wish you the best of luck in finding the right social media team. Within a few minutes, she replied back thanking me for my honesty, wished me well and I breathed a huge sigh of relief feeling validated that being truthful always wins. Later that night I learned that she had taken to her personal Facebook page to voice her frustration of being turned down to work with because "their Christian values would not support" her business or vision. She went on to say that while she "appreciated the honesty" she wanted to "ram [her] head into a wall of frustration" but found another more expensive provider concluding that "as one creepy door closes, another opens as a beacon of light." This was my first experience of being called out for my faith and the comments that ensued quickly blasted me for my hypocrisy in calling myself a Christian and while she did refrain from naming me in the post, it was still disheartening, hurtful and the worse part was a piece of me felt like I had done something wrong. That I should be ashamed for my beliefs. As I shared this experience and the lessons that God has been revealing to me through this with a close friend who runs a Christian women's health coaching academy, she opened up about a similiar situation that she faced in declining to work with a business owner because of a conflict of her faith and unfortunately that person did take to social media and publicly shamed her by naming her and tagging her business page. Her story brought to light for me the very real hardships other Christians in business are facing. There is no denying that as Christians we are facing some trying times where society wants us to bend God's word in the name of inclusion and acceptance. While we are called to love others as Christ loves us, we also have the right to use our discretion to say "no" without apology to anything that does not align with our beliefs. I find it interesting, to say the least, that it's perfectly acceptable to decline with a reason like "working with you is not a good fit" but choosing to be honest about a religious conflict is "creepy" and "frustrating". I want to encourage you as a Christian business owner to stand strong in your faith without fear or intimidation. To honor God in your life and your business, even when society pushes back with the opinion that it's unpopular. I pray you will receive any situation with grace and kindness to show God's mercy and love through it, even though it will undoubtedly be unnerving and hurtful. I never addressed the Facebook post with the person, instead I chose to bless and release it to focus on the message God has for me in all of this. Situations will inevitably surface where you will be faced with having to decline in working with a client, business or customer because it would not honor God's plan for your life or business. It may feel scary to face that situation and the unknown consequences head on but know this, when we fearlessly serve God, He will always faithfully answer. Seek His counsel and lay any and all burdens at His feet. Open your bible and pour yourself into other examples of feminine courage like the stories of Ruth and Esther and put your soul at ease with the way God responded with His grace and blessings. Let it fill you with hope and peace through your own situations. I continue to find peace in Jesus through the trials I face in my own business as a Christian. That because of Him, I can be confident in God's love for me and, by His favor, I can bravely and confidently pursue the path He has laid before me. Would love to hear your thoughts, struggles and stories as a Christian business owner so be sure to leave me a comment but please be respectful. Let us not blast others for their beliefs, instead, let's coming together in support of and in empowering one another.